BACK in the eighties, when she was in school in Mumbai, Sangeeta Ghosh was an extraordinary student. She would top her class and would lead in sports and dramatics. And ever since she left school in 1988, she has acted in 11 serials and three telefilms. Her best is Aruna Irani’s currently on Des Mein Nikla Hoga Chand on Star Plus every Monday where she plays a vivacious and chirpy young lady. "It’s a positive role," says Sangeeta who did the lead in Aruna Irani’s earlier hit serial, Mehendi Tere Naam Ki. Though most of the shooting is done in London, Sangeeta Ghosh’s heart is very much in India. The actress says she has a different agenda for herself as far as her career goes. Unlike other stars who have role models from the world TV and films to look up to Sangeeta like Jasminder (Jess) in Bend it like Beckham has a sportsperson as her idol. And the answer is instant. "There’s only one person I want to emulate and that person is Sachin Tendulkar. He is just brilliant. I simply idolise him." Being one of the top students of her school, she dreamt of becoming ‘somebody’. Hardly anyone could imagine that someone was Tendulkar — not just successful but a big hit! What with Laloo Yadav having set Bihar’s cops to nab the makers of Raamkhilavan C.M. & family, the ratings of the serial and that of Sab TV are going through the roof. Even other shows too are reaping the high viewership bonanza. One of them is Yes Boss Wednesdays and Thursdays at 8.30 p.m. The serial is now back with a new boss lording over the husband-and-wife team of Mohan (Rakesh Bedi) and Meera (Kavita Kapoor). Meera is the creative director of an advertising agency and Mohan is a junior visualiser in the same agency. He reports to his wife at work and ends up looking after his mother-in-law and managing household emergencies, thanks to Meera’s busy schedule. The boss has a strong aversion for Mohan, who has an uncanny knack for creating disaster and chaos. To maintain a professional image and forced by circumstances, Meera and Mohan decide to keep their relationship a secret from their boss. This all-new programming has a new twist in the tail. There’s a new boss over the head of the old boss. 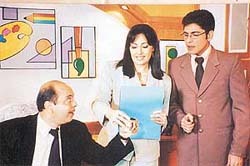 This forces and Meera and Vinod to re-work their strategies, leading to a series of amusing escapades. Definitely worth your time as there’s not a dull moment. Romance is in the air again with Love Marriage on Zee TV from Monday to Thursday at 8 p.m. The serial is all about waiting to fall in love with the right person. Not much to hang a story on but then, a lot of such passes off as entertainment these days. The story revolves around four young girls who come to Mumbai from different cities in search of love. Even as Anu, Meera, Sonali and Kiran nurture their desire of finding their Mr Right they get far more than they bargained for. The foursome live with their landlady Mrs Dixit (played by Apara Mehta of Kyonki Saas Bhi Kabhi Bahu Thi) Fate has brought them together — the common string being they are all looking and waiting to find a guy to get married to. As the title suggests, the scope of the serial is very narrow. So, if you are looking for ambitious young ladies with professional goals in mind, perish the thought. There’s a decadence that runs through the serial. Vacant minds pining away for love. Simple and ineffective as far as the scripting goes. After years, it’s back again and it has still not lost its freshness. Sea Hawks on Star Plus every Saturday at 7 p.m. is a thrilling high seas drama. 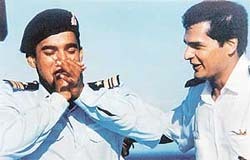 The pivot of the series is the Indian Coast Guard, which is a multi-mission independent armed force. There’s plenty of action as the coast guards battle terrorists and mafia syndicates. Sea Hawks is shot in the exotic locales of Mauritius, Goa, Daman and Lakshadweep where rival smuggling groups rule the seas. They smuggle in lethal weapons and drugs and engage in bloody battles with the dedicated members of the coast guards. With sparkling wit and sizzling action, Sea Hawks deftly weaves an international web of intrigue around the armed forces and even probes their personal lives and their loves. Even if you have seen the series on a different channels many years ago, it’s worth another look specially so for the slick performances by stars like Om Puri, Madhavan, Nikki Aneja, Milind Soman and Simone Singh. With such a star cast and lavish sets, the series still packs a punch. Pyramids reached their peak, so to speak, under the Egyptians, but their history covers a far wider horizon than the great structures of Giza reveal. Fired by religion and fueled by technology, pyramids appeared around the world from China to the Americas. In Pyramids, Mummies & Tombs, August 25 at 7 p.m., on Discovery Jgyptologist Bob Brier takes viewers on a picturesque tour of ancient world wonders that housed famous mummies, served as sacrificial platforms and entombed all kinds of treasure. The humorous, knowledgeable and ever-enthusiastic "Dr Bob", a mummy expert who chairs the philosophy department at the Long Island University in New York, USA, crosses oceans and deserts to give viewers rare glimpses of hard-to-access pyramids. 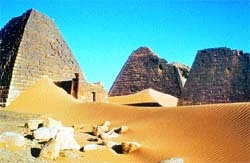 Filmed on location in Egypt, China, Mexico, Peru, Indonesia, Sudan and more, the show reveals the universality of pyramids and explains their popularity. The series addresses a central question: Why do these pyramids, separated by continents and built by cultures that never came into contact with one another, look so similar? Dr Brier has a simple answer. Without steel teams or flying buttresses pyramidal shapes were the only way for stones to pile that high without collapsing under their own weight. An absorbing series that is both informative and entertaining. For those who love the mountains this is a stunning show about someone most of us are now familiar with. Wild Man of the Himalayas, on August 27 at 10 p.m. on the National Geographic Channel, is all about the myths and reality of the Yeti. For centuries, the remote Buddhist kingdom of Bhutan has fiercely guarded its centuries-old secrets. For the first time ever, an expedition of scientists has been permitted to search for the Yeti. Known as the Meeguey to the Bhutanese, the mythical beast is said to inhabit Bhutan’s unexplored mountains in the eastern Himalayas. The show presents an eyewitness account, footprints,, a mummified body and hair Samples — collected with the help of a local yeti-hunter — that provide clues for this tantalising high-altitude quest. Is there a rational explanation behind these legends? Be a part of the adventure where scientists set out with camera traps, night-vision equipment and DNA testing techniques in quest the elusive and enigmatic yeti.